– How will you Improve Clean and Safe Water Worldwide, while the North German Lloyd (Hapag-Lloyd AG) Cargo Ship “the Goslar” is Still Polluting our Waters for Decades, especially the waters in Suriname and the Caribbean? –	How are you going to Improve our world to be HIV/AIDS, Cervical Cancer and Breast Cancer Free? –	Why do you play La Boeuf in your upcoming film “True Grit”? I am awaiting Matthew Paige "Matt" Damon’s replies. Since the floods in August, Pakistan has been facing major water and sanitation issues. Does Water.org have any plans of setting up some sort program in the flood affected areas? Also, kudos to you for all your philanthropic work. It really is very inspiring. With all the demands on your time and all of the great causes to choose from, how do you decide which philantropic projects to support and dedicate your time to? How do you feel about Obama now that a couple of years have gone by and you had some accurate yet piercing criticisms of Palin? How do you feel about Joaqin Pheonix's "mockumentary" which seems to have mocked and wasted the time of several players in Hollywood? Hello Matt, My question is, what is your next move in entertainment? More specifically, you've been an actor in many high profile films and a screenwriter in several as well, do you have any directing ambition or goals yet to achieve? You seem to pick roles that show truth about our culture and how it affects the world in general. What do you think would be the most significant thing the average person should do to bring about a positive effect in their lives? Hi there, we have an increased amount of poverty here in Buenos Aires and throughout Argentina. Do you take part in any charities in South America? 1) What movie is his best ? 2) What movie that he played is his best ? Will there be Bourne 4? "How can we save our mother Earth from the real devils : humans, the consumerism, high standard of living, fast food life style, race to live the better and the best life, companies expanding the peoples never fulfilling needs ? " 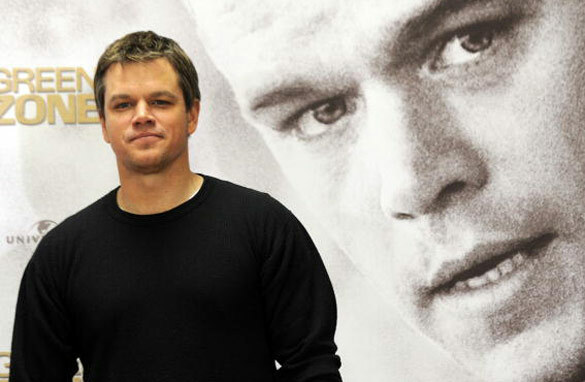 Do you think you were "bourne" to be a actor? Congratulations to your and your family for your new baby girl. I wish you all well. I have been telling all of my friends for years that you are my favourite actor and you deserve all the credit that comes your way. My questions are simply this: Matt if one of your friends asked you to describe your first impressions of Australia, what would you say to them? and secondly when are you coming back to Australia? Your favorite actor and actress to work with? When, in your assessment, is the best time to take your shirt off in a movie? Also thanks for all your philanthropic efforts. Why are you not coming back for the next Bourne movie? Why? Why? Why? People love the movies, and they love you as Jason Bourne. The next instalment is bound to be far worse without you. I know that the simple answer is that you would not be able to work with the original director. But this just all seems so wrong. All is not well in the universe. I speak for millions! What can we expect from you and the other members of the Film Actors Guild (F.A.G) in 2010? You've mentioned previously that before the Bourne trilogy you felt your career was stagnating. During this time were you ever pestered by studios to do a Good Will Hunting sequel and was it ever tempting? Congrats to you and your wife Luciana on the arrival of your girl Stella Zavala..
Dude, you're awesome. Any future plans to do classic remakes of any superhero movies or something similar?? You'd make a good superhero!!! One simple question: where could I send you information material as well as some samples,Sir, of a nutritional supplement which helps people to strengthen their immune system and start probably a joint operation, where people need it the most? By the way permit me t o use this opportunity to wish you from the bottom of my hearth always good health, a lot of success, happiness and good luck in all your endeavors! How was it to play in Talented Mr. Ripley after beautiful french movie and Alen Delon? What do you think in general about the differences between European and American movies? Are they getting closer? Tom Ripley, when are you coming to India, not just for goodwill hunting but to make a movie? HI MATT, HAPPY TO HEAR ABOUT THE NEW BABY, IT THIS IT OR ARE YOU GOING FOR THE BOY, LOVE YOUR WORK, MIKE FROM DENMARK! i haven't seen you in a mafian film, why? What you're doing is wonderful - your work on screen and off. River Rose or something. River Rose and the Heart of Africa or River Rose and the Horn of Africa. Will you ever make a narrative film (not a doc) about your philanthropy work? When I heard about this River Rose script, I immediately thought of you and your water.org foundation. Thanks! And best to you in everything! i haven't seen u in mafia film, why? Hi! What do u dream you'll be doing in 30 years time? I just have one question. Why are you so awesome? You have been involved in clean water for many years, first with H2O Africa and now with Water.org, how did you decided that clean water was going to be your focus? Congratulations to you and your wife on your brand new baby! I admire you personally and profesionally. Good Will Hunting is one of my favorite films and touched me like nothing else. It is nothing short of admirable. Which of you two came up with the idea for the screenplay? How did you go about writing it? Where you inspired by people in your life? And just a comment, I think you have been very clever at distinguishing the Hollywood glitter from the real thing. Congrats again! are you ever thinking about being a director just like another actors/actress ? I really so proud of my self ,being your die hard fan ,specially when i know how you're trying to help the other people whose life is terrific. Yes we are the world. First, congrats on your new daughter! 1) Can you discuss Haiti's cholera outbreak in context with the work being done by your water.org. 2)You've worked with an array of great directors. As an actor do you prepare differently for a director who wants 50 takes (Scorcese) vs one who likes one or a few (Eastwood)? Which role do you consider to be the key-one in your career? What did it give you and what did it take from you? And If you had the chance to turn back time,what would you change in your career? Hi Matt, what do you see as the biggest obstacle for OneXOne to be able to implement health care, water, food and education for the less fortunate children? I would like to ask this question: What is the best way to get into the acting business? you are tackling the most crucial problem of millions of people around the globe. we hope that other fortunate people like you do not throw away their wealth and join you in your efforts to increase the well-being of the less fortunate. How was work on The Talented Mr. Ripley and how that affected your career as one of the greatest actors ever known? I wld like 2 watch d programme on thursday cause i hv dstv on my phone and i wld like 2 keep charting with u .pls reply bk.